Hillary Clinton, drawing a contrast with her Republican rival Donald Trump, promised to be strategic in foreign policy and inclusive in social and economic affairs in her nomination speech on Thursday night. 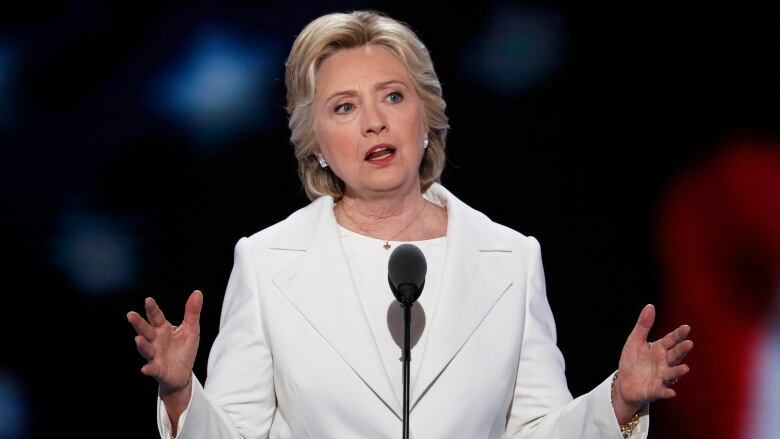 Hillary Clinton, drawing a contrast with her Republican rival, promised to be strategic in foreign policy and inclusive with respect to social and economic affairs in her nomination speech on Thursday night. "It is with humility, determination and boundless confidence in America's promise that I accept your nomination for president of the United States," she said to thunderous applause at the Democratic National Convention in Philadelphia. She is the first female presidential nominee for a major party in the U.S.
"When there are no ceilings, the sky's the limit," she said of the historic accomplishment. Clinton made the case for steady leadership if she is elected, saying the nation is "stronger together" than it would be under an authoritarian president, her characterization of Donald Trump. She took Trump to task for divisive remarks on the campaign trail and said she'd govern "for all Americans," no matter their station in life. Earlier in her speech, she praised primary campaign rival Bernie Sanders, and made a pledge to his supporters. "Your cause is our cause. Our country needs your ideas, energy and passion," she told them. Clinton praised the economic stewardship of Barack Obama after the 2008 recession, but admitted the Democrats can do more for working-class and middle-class voters. "We haven't done a good enough job showing we get what you're going through," said Clinton, promising the creation of "good-paying, clean-energy jobs" if elected. Clinton re-emphasized the party's commitment to being pro-choice, for equal pay for equal work and committed to alleviating the financial burden on college students. Following reports Russia hacked Democratic Party emails, Trump said Wednesday he'd like to see Moscow find emails Clinton deleted from the account she used as secretary of state. Trump has since insisted he was being sarcastic, but it gave Democratic speakers, including Clinton, considerable fodder for a second straight night in Philadelphia. Trump also suggested last week in an interview that support for certain unnamed NATO allies might depend on their financial contributions. "I'm proud to stand by our allies in NATO against any threat they face, including from Russia," said Clinton. Clinton referred to the places that have been rocked by tragic bombings and shootings in recent months, saying that the U.S. needed "steady leadership" in response to tumultuous events. "He loses his cool at the slightest provocation ... imagine him in the Oval Office facing a real crisis," she said of Trump. "A man you can bait with a tweet is not a man we can trust with nuclear weapons." Trump gets a post-convention bump; will Clinton be next? The candidate was introduced by Chelsea Clinton, who described her mother as a woman driven by faith, compassion and public service. Should Clinton, 68, win the November election, she will be the second oldest president to take office, after Ronald Reagan. 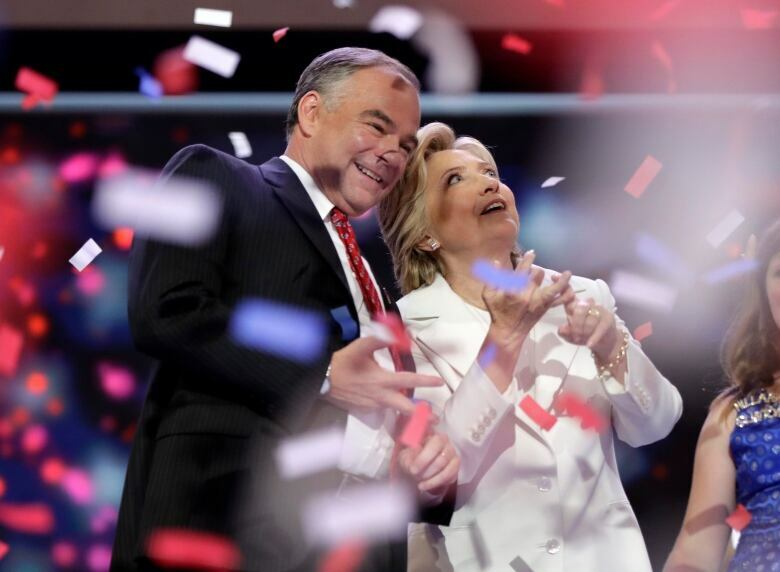 She would reach the White House 24 years after her husband Bill began the first of two terms in office. Earlier speakers attempted to contrast the differences between Clinton and Trump, in terms of both political experience and their vision for the country's future. Retired marine general John R. Allen, a former commander in Afghanistan said that with Clinton as commander-in-chief the military wouldn't engage in torture during interrogation — which Trump has endorsed — and "our international relations will not be reduced to a business transaction." While Allen spoke, some at the Wells Fargo Center chanted "No more wars," which prompted a louder swell of "U.S.A.!" from others. New York Gov. Andrew Cuomo took aim at Trump's "Make America Great" slogan and accused Republicans of peddling a nostalgic era that never existed. "I want to know what good old days do they want to take us back to," said Cuomo. "Do they want to take us before the Civil Rights Act? Do they want to take us back before minimum wage and worker protection laws? Or do they want to take us back before Roe vs. Wade? "Well, we have a different vision. We're not going back, we're going forward." Khizr Khan emotionally implored voters to stop Trump, who has called for a temporary ban on Muslim immigration. Khan lost his son, Humayum, who was killed by an improvised explosive device in 2004 in Iraq while serving in the U.S. army. "Donald Trump, you are asking Americans to trust you with their future," Khan said. "Let me ask you, have you even read the United States Constitution? I will gladly lend you my copy." Illinois Representative Tammy Duckworth, an Iraq war veteran who lost her legs in combat, said: "I didn't put my life on the line to defend our democracy so you could invite Russia to interfere with it." Earlier Thursday, the first-ever speech by an openly transgender person at a U.S. political convention was delivered. Sarah McBride, national press secretary for Human Rights Campaign, said her late transgender husband's optimism inspired her activism. "Today in America, LGBTQ people are still targeted by hate that lives in both laws and in hearts," said McBride. "Many still struggle just to get by. But I believe that tomorrow can be different. Tomorrow we can be respected and protected, especially if Hillary Clinton is our president." The speakers followed a night in which Obama anointed Clinton the inheritor of his legacy, delivering a passionate case for his onetime rival.